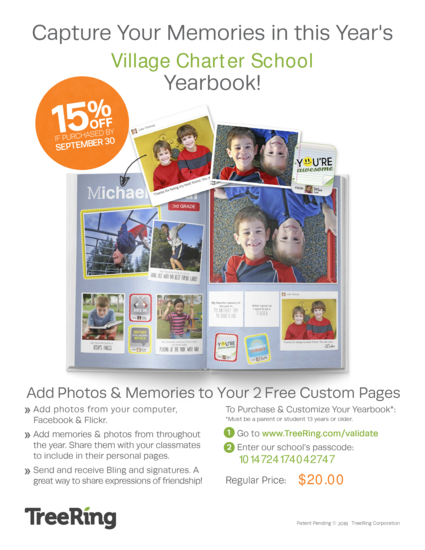 Early Bird Discount: VCS Yearbooks are 15% off! Sep. 22, 9am-2pm: Schoolyard Habitat Workday. Hello Village Families. If you are volunteering in the garden, the classroom or are helping out in other ways, please remember to sign in, on the volunteer sign in sheet, in the office. 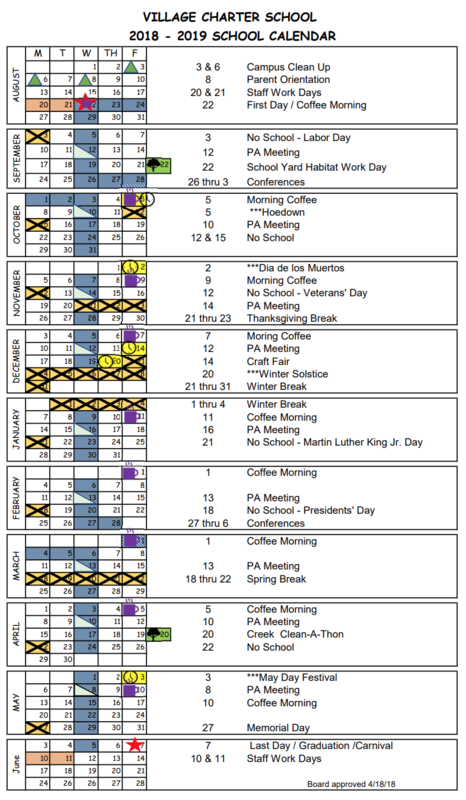 A few changes have been made to the calendar. · Conference dates have been added to the calendar. These are 1:00 dismissal days for ALL students. o Feb 27 thru Mar 6. · The Hoedown has a new tentative date of Friday, Oct 5. Illness - If your child is absent you are to call or email the school. Please give the reason to help track illnesses. Planned Absences / Independent Study - If your child has a planned known absence coming up, please complete an Independent Study request form a minimum of 3 days prior to their first missed day. Forms can be found on the website in the office. Tardy - If your child is late to school, 8:31 or later. They are to be brought in to the office and signed in by an adult. Younger students will be walked to class by office staff. What weighs over 4,000 pounds and is scheduled for delivery to VCS mid-September? That would be our Schoolyard Habitat Project rock features! * These boulders (yes, boulders!) and cobbles will be placed throughout the project to provide habitat for our reptile and amphibian friends as well as places for us humans to interact with and enjoy nature. Our Schoolyard Habitat’s first workday is right around the corner… please come on Saturday September 22nd from 9:00 – 2:00 (or anywhere inside that window) to help do some major site prep work. We are encouraging families to come, however, this time the work will be done by the adults amongst us while our kids enjoy each other’s company. After this site preparation workday our classes (and future workdays) will be superbly setup to accomplish creating our Schoolyard Habitat! 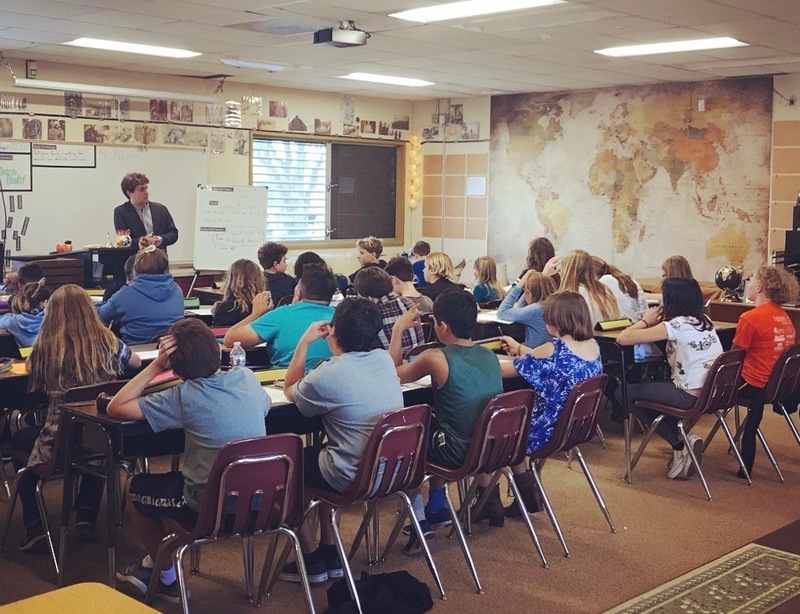 Questions should be directed to Miss Barnum in person. There will be a Gala event planning meeting, Tuesday, August 28th from 8:30-9:30am at school. Please meet by the outside picnic tables. All help is welcome and appreciated. This section will be used to detail how VCS’s students and school community creates and connects to the exploration and care of our natural world. Let’s start by congratulating ourselves! Many months have gone into preparing a proposal that has now paid off, literally. VCS has been awarded $3,200 from U.S. Fish and Wildlife Service to implement a Schoolyard Habitat and Outdoor Classroom Program. Over the span of this coming school year, we will install native planting areas and habitat features designed to engage our whole school community in the stewardship and study of nature. We will be creating a Butterfly and Bee Habitat Garden (our version of a B&B), Habitat Hill (complete with bird nesting boxes students will build, monitor and maintain) as well as a Lizard Lounge (features for amphibians/reptiles along with a mini wetland to provide water for all). All VCS classes will be involved in the Schoolyard Habitat creation as well as by our families coming together on work days (stay tuned, first workday is coming in September!) There will be much work to do this school year knowing that our work will provide countless years of learning in our very own living laboratory! Please contact Hattie (hatfield.turner@gmail.com) or Stephanie (stephanielennox@comcast.net) if you would like to take a leadership role in this project or with any questions. The mission of the Schoolyard Habitat and Outdoor Classroom Program is to get students to experience nature. The Program helps schools create natural spaces on school grounds where students will observe, draw, write, think and question. A Schoolyard Habitat project restores native wildlife habitat while including features that support students frequently going outside to learn, discover, create and celebrate the environment. During the formative years of life, students develop perceptions and values about their environment. Schoolyard Habitats can provide students with a powerful example of land conservation and stewardship. I have a huge appreciation for all the “greening” support Jasmine Maes has graciously given these past several days. Our days are more beautiful because of you. A huge appreciation to all my parents who have had their children here on time and ready to start their day!